You don't have to sacrifice healthy eating just because of the holidays. Below are some healthy recipes that Dr. Lanphier's uses in her home. We hope these recipies will make your holiday baking not only delicious but healthy! Mix sugar and milk together in a heavy-bottomed saucepan. Stirring often, bring to a low simmer over medium-low heat. As soon as steam starts lifting off the milk, lower the heat even further, and when the sugar is entirely dissolved, put the heat as low as it can go. A simmer burner is great for this. The goal is to reduce the quantity in the pot (which is not about 1 3/4 cups) by approximately half. It takes about 2 hours at very low heat to reduce to one cup of liquid. You could speed it up a bit if you watch carefully and stir often. I preferred the freedom to wander the house doing other tasks, and thus allowed my process to take quite some time. Once reduced to your satisfaction, whisk in the butter and vanilla.The recipe is equivalent to approximately one half can of brand sweetened condensed milk. 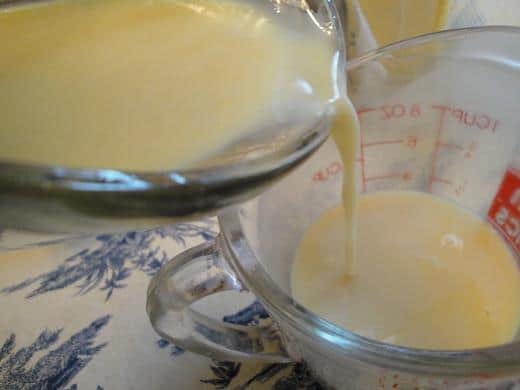 Depending on what final product your sweetened condensed milk will be used in, you will probably need to allow the mixture to cool considerably before using. One other option for a homemade sweetened condensed milk is to add 1/2 or 2/3 cup unrefined sugar to a can of evaporated milk. You may need to heat to fully dissolve. However, you still have to deal with the unhealthy can lining and whatever over-processing makes the milk shelf stable. 2 organic or locally grown tomatoes, diced (about 2 lb.) Can also use grape tomatoes. 1/2 cup organic/homemade ranch dressing or vinaigrette. Spread on top. Place eggs in a medium saucepan with cold water to cover. Bring to a simmer over medium heat. Remove from heat, cover pan and let stand for 10 minutes. Drain eggs and cool in ice water. Peel and set aside. Cook bacon in batches in a large, heavy skillet over medium heat until crisp, about 10 minutes. Drain on paper towels. Tear bacon into pieces. Arrange tomatoes, peas, Cheddar, olives, celery, green onions, greens and bacon in layers in a large (5-quart), clear bowl with straight sides. Using a clear bowl will make for a beautiful presentation! Just before serving, quarter eggs and place on top. Serve with dressing on side, tossed or on top of salad. In a large clean 5 gallon bucket, place all brine ingredients and stir to combine. Add 15-20 pound turkey and allow to marinate for 24 hours in fridge or large picnic cooler. Refrigeration is always required while brining. Cook turkey as you prefer. Brining is like a marinade, as it keeps food moist and tender. Brining or salting is a way of increasing the moisture holding capacity of meat resulting in a moister product when it is cooked. Salt changes the structure of the muscle tissue in the meat which allows it to swell and absorb water and flavorings which results in a tender turkey or chicken once cooked. Give it a try! The meat and brine solution must be kept below 40 degrees F. at all time. Since brining does not preserve meat, the turkey and brine must be kept refrigerated at all times. If storing the poultry in the refrigerator during brining, check to make sure that the container will fit in your refrigerator first! A container large enough to hold a whole turkey might be too big for your refrigerator. First, choose a cooler that is large enough to keep the turkey completely submerged during the brining process. It is important to thoroughly clean and sanitize the cooler before and after use. You must keep the poultry and brine cold without diluting the mixture when using a cooler. Put the meat and brine directly in the cooler, then place Ziploc bags filled with ice or reusable gel packs into the brine solution. Another approach is to put the turkey and brine into a turkey oven roasting bag inside the cooler, and then pack ice or gel packs around the bag. Monitor the temperature of the cooler to make sure it stays below 40 degrees F. at all times. Use large brining bags. These brining bags are very easy to use and take up less room in your refrigerator or cooler. Bags are sold large enough to hold a 20-pound turkey. Do not use garbage bags as many of these are treated with chemicals! Every now and then, turn the bag around and upside down to ensure even brining. For brining chicken, use either small brining bags or regular re-sealable plastic bags. This method requires no basting because the turkey roasts covered, sealing in juices for extremely tender meat. Savory herbs add a wonderful aroma and delicate flavor. For an especially juicy turkey, brine your bird before roasting. Remove neck and giblets. Lightly coat the bird with fresh-squeezed orange juice. Rub olive oil or butter, salt and pepper underneath breast skin. Salt and pepper chest cavity. If desired, use trussing string to tie turkey legs together and close cavity. Cover bottom of roasting pan with 1/4" of broth. Add 1 bay leaf, 1/2 cup white wine, and a pinch of aromatic herbs such as thyme, rosemary and savory. Place the bird breast-side up on a rack in a covered roasting pan. A covered roasting pan allows the turkey to self-baste, as does a cooking "tent" made from aluminum foil. If you are using a meat thermometer (and you should! ), place it into the thickest part of the thigh without touching the bone. The turkey will be done when the thermometer reaches about 175 to 180°F. Without a thermometer, figure 15 minutes per pound. Start checking for doneness about an hour before the end of the recommended roasting time. A 12 to 14 pound turkey should be done in about 3 to 4 hours or when juices run clear when thigh is pierced. Note: If you want to stuff your turkey, do so about 30 minutes before turkey is done, using previously baked dressing. Return turkey to oven. For a beautiful golden-brown turkey, remove lid and turn the heat to broil or high for the final 30 minutes. Scoop out the stuffing as soon as the turkey is done. Let turkey rest 30 minutes before carving. Reserve drippings for gravy. Preheat oven to 375°F. Place potatoes in 13 x 9 x 2-inch glass baking dish. Combine butter, sugar, cinnamon, nutmeg, ginger and salt in small saucepan over medium heat. Bring to boil and stir until sugar dissolves. Pour this mixture over sweet potatoes and toss to coat. Cover dish well with foil. Bake 50 minutes. Uncover and continue to bake until potatoes are tender and syrup thickens a bit (basting occasionally) about 20 minutes. Raise oven temperature to 500°F. Top sweet potatoes with cubed marshmallows and pecans and bake until marshmallows begin to melt and nuts begin to brown, about 3 minutes. *natural marshmallows available in some of the Whole Foods Stores. Per Serving (273g-wt. ): 420 calories (120 from fat), 13g total fat, 5g saturated fat, 8g dietary fiber, 6g protein, 75g carbohydrate, 20mg cholesterol, 240mg sodium. 1. Cook the potatoes in boiling salted water until tender, about 15 minutes. 2. Preheat oven to 450°F. 3. Heat 1 tablespoon of olive oil over medium heat in a skillet. Sauté the onions, celery and red pepper for 7 minutes, or until tender, stirring often. Set aside. 4. When the potatoes are done, drain them well and return to the cooking pot. Add the butter and the milk. Mash together well. Add the sautéed vegetables. Season the mixture to taste with sea salt and white pepper. 5. Spread the remaining tablespoon of olive oil in an 8×8 or 9×9 casserole dish. Spoon mashed potatoes into the dish and sprinkle with grated Romano cheese and paprika. Bake for 20 minutes or until golden brown. These sweet, spicy, slightly salty nuts make a great snack, appetizer and garnish for salads and desserts. Once cooled, they'll keep in an airtight container for a week or two. Preheat oven to 300°F. Line a baking sheet with parchment paper. Whisk sugar, salt and spices in a small bowl. In a large bowl, whisk egg white until light and frothy. Add nuts and toss until evenly coated with egg white. Sprinkle sugar and spice mixture over nuts and toss to combine well. Spread nuts in a single layer on the baking sheet and bake until dry, 40 to 50 minutes, stirring once or twice. Cool to room temperature before storing in an airtight container. Spoon this hot chocolate mix into jars to give as gifts, or keep some on hand in your own pantry for chilly afternoons. For a burst of flavor, try steeping a bag of mint or almond tea in the mug along with the hot chocolate. Put sugar and vanilla bean into a food processor and pulse until vanilla bean is very finely chopped and well incorporated. Strain vanilla sugar through a fine sieve, discarding any large pieces of vanilla bean that remain; transfer 1/2 cup of the vanilla sugar to a large bowl. (Save remaining vanilla sugar for another use.) Add milk, cocoa and salt to bowl with sugar, stir well and then transfer to an airtight container.